At one time Adair County was a portion of the large County of Des Moines, also the northern tier of townships was a part of Keokuk County from December 31, 1837, until July 30, 1840. Adair County, as it now exists, was created by an act of the Third General Assembly, approved January 15, 1851. The name of the county was given in honor of Gen. John Adair, a distinguished officer during the War of 1812 and the sixth governor of Kentucky. By chapter 8, acts of the Fourth General Assembly, the county was made a township of Cass County for election and judicial purposes, but shortly afterward Adair was fully organized within itself. The first election was held at the house of Alfred Jones. During the first years of the county's existence the control of the governmental affairs was placed in the hands of a County Court, instead of the board of supervisors, as is now in vogue. The County Court consisted of a judge, a prosecuting attorney and a sheriff; the heaviest work fell upon the shoulders of the judge. He had supreme jurisdiction in all matters which could not properly be brought before the District Court. The other members of the triumvirate were simply assistants to the all-important judge. The first regular meeting of the Adair County Court was held on May 6, 1854, at the house of Judge George M. Holaday. The only business transacted by the court at this meeting was the issuance of a marriage license to William Stinson and Elizabeth Crow. At the July term of the court it was ordered that "the County of Adair be divided into two election precincts, the center line running north and south to be the dividing line, the east half to be known as Harrison Precinct and the west half as Washington Precinct. Ordered, also, that Alfred Jones, Thomas N. Johnson and Nathan Wooart be appointed township trustees of Washington Precinct." At the September term of the court the first levy of taxes in the county was made, the same at the following rates; For state revenue, 3 mills on the dollar; county fund, 6 mills; school fund, ½ mill; road tax, 1 mill and $1 poll; county poll tax, 50 cents. "In pursuance of an Act of the General Assembly of the State of Iowa, approved January 15, 1855, for the location of the seat of justice of the aforesaid County of Adair; We, G. B. Hitchcock and Elias Stafford, two of the commissioners appointed by the aforesaid act to locate the seat of justice of said county, have met at Adair Postoffice, on the 24th of April, 1855, and proceeded to locate the seat of justice of said County of Adair, on the southwest quarter of section 17, in township 75 north, range 32 west, as above directed by the aforesaid act. We, the said commissioners, have been duly sworn as above directed. This done in Adair County, this April 27, 1855. The name of the county seat above described shall be Summerset. The town of Summerset is now known by the name of Fontanelle. The records of the court, of the first Monday in July, 1855. contain the following entry which may be of interest as showing the remuneration of some of the early county officers: "Ordered, that John Gibson, county clerk, be allowed in all for fifteen months' salary as clerk, $62.50. And that G. M. Holaday be allowed $52.50 as his salary for fifteen months, from the 1st. of April, 1854, to the 1st of July, 1855." At the July term of the County Court a new township was set off, consisting of congressional townships 74 and 75, ranges 30 and 31, which was called Grand River. Robert Wilson, Charles Wilson and William Swears were appointed trustees of the same. Also townships 76 and 77, ranges 31, 32 and 33, were set off and formed into a civil township under the name of Jefferson Township, and M. Hollingsworth, Samuel Miner and William Tingbe were appointed trustees thereof. On August 1, 1855, J. J. Leeper became county judge. He ordered that the court be held at his house until the necessary county building at Summerset had been erected. At the session of the court held January 7, 1856, the following order was made: "Ordered, that there be a courthouse built in Summerset, Adair County, Ia. ; and ordered further, that the said house be advertised to be sold to the lowest responsible bidder on the 10th day of February, 1856. The said house to be 26 feet wide, 36 feet long, 10 feet high, and to contain three rooms, all to be finished in good style." In accordance with this order the contract was let to James Ray, upon the above date; he to finish the courthouse and to have it ready for occupancy by October 1, 1856, for the sum of $1,250. At the March term of the court of this year congressional townships 74 and 75, of range 32 west, and township 75, range 33, were made a civil township under the name of Summerset. The first petition for a road was presented to the court by Mr. Cutler in October, 1856. The judge appointed James Walker as a commissioner to view the same and report. On the 25th of August, 1857, the court met, when Manning Drake, the newly elected county judge, handed in his resignation, which was accepted, and while D. M. Valentine, the prosecuting attorney, acted as judge, the office was declared vacant. Mr. Valentine held the position as acting judge until April 13, 1858, when a successor was sworn into office. This was F. M. Corr. At the July term, 1859, the judge, on a petition to that effect, set off a township consisting of townships 74 and 75, range 31, which as to be known as Greenfield, and ordered that W. G. Bagg be appointed organizing officer. During the administration of Judge Corr, on October 18, 1860, a petition was presented asking that township 76, range 32, be set off and made into a new civil township under the name of Grove; which the court granted, and ordered that the first election therein be held at the general election in the following November. It was not long after this that the County Court fell into disuse. With the coming of the year 1861 the board of supervisors transacted most of the business formerly the duty of the court, consequently the latter department rapidly fell into decline. Auditing and the paying of claims against the county and the granting of marriage licenses comprised most of the business during these last months of its existence. The first regular session of the board of supervisors was held at Fontanelle, then the county seat, on January 7, 1861. There were present the following men, who were duly sworn into office: Mathew Clark, Greenfield Township; R. W. Champlin, Washington Township; Benjamin Minett, Richland Township; L. C. Elliott, Harrison Township; John Loucks, Jefferson Township; James Thompson. Walnut Township; Jacob Bruce, Grove Township; L. J. Wilson, Grand River Township; Azariah Root, Summerset Township. The board proceeded to organize by electing Azariah Root chairman for the ensuing year and drew lots for the term of office for each member. Much of the business at the beginning seems to have been the straightening up of old matters. At their meeting upon the 4th of June, however, in answer to a petition to that effect, set off a new civil township which they called Lincoln Township. This comprised congressional township 77 north, range 30 west. Zimri Horner was by the same act made organizing officer and the election for the first offices was set for October 2, 1861, the house of Dominick Nunon. The board of supervisors for the year 1862 was composed of the following: James C. Gibbs, Summerset; Azariah Root, Jackson; S. C. Vance, Greenfield; L. C. Elliott, Harrison; Jacob Bruce, Grove; John Loucks, Jefferson; A. J. Ross, Washington; Benjamin Minert, Richland; L. S. Wilson, Grand River; James Thompson, Walnut; Milton Mills, Lincoln. These parties met at the courthouse in Fontanelle on January 6th and elected James C. Gibbs as chairman. In October of the same year James C. Gibbs resigned his position as member of the board and Azariah Root, having removed from Jackson Township to Summerset, made a vacancy in the representation of the former subdivision of the county. On January 5, 1863, the new board for the year assembled at Fontanelle and the following gentlemen were present: Benjamin Minert, Richland; S. C. Vance, Greenfield; S. W. Armstrong, Summerset; Milton Mills, Lincoln; A. J. Ross, Washington; John Loucks, Jefferson; Jacob Bruce, Grove; Abner Root, Jackson; L. J. Wilson, Grand River; James Thompson, Walnut; Fielden Key, Harrison. Resolved, by the Board of Supervisors of Adair County, Ia., that resolution No. 13, appropriating the special tax voted for the families of volunteers, be so amended that the committee therein named shall not, in making said distribution, be confined or limited to families of volunteers who enlisted in Adair County, but that they shall act in good faith and relieve all families of volunteers residing or that may reside in the county to the extent of the funds provided, acting in their discretion in making the distribution. The swamp lands of the county were at this time sold by the county to B. F. Allen of Des Moines for the sum of $1,500, which was appropriated for the bounty of the soldiers. In October, 1864, the board passed a resolution to pay the same bounty of $100 to each and every one who had volunteered in the service of the United States and who was credited to Adair County or to his heirs if he were dead, thus equalizing the bounty. At the same time a resolution was passed that instead of the relief to the families of volunteers being in the hands of a committee and irregular in its action, $12 per quarter to allowed to the wife of the volunteer and $6 per quarter to every child of the same under twelve years of age. Besides this, provision was made for any others who were dependent upon any volunteer, so that none might suffer in their absence. The first meeting of the board of supervisors for the year of 1865 was at Fontanelle on January 2d, when the following men were present: Benjamin Minert, Richland; S. C. Vance, Greenfield; J. W. Stinman, Jackson; S. W. Armstrong, Summerset; Fielden Key, Harrison; Moses P. Stockwell, Walnut; Milton Mills, Lincoln; F. M. Corr, Washington; John Loucks, Jefferson; John Augustine, Grand River,. Grove Township had no representative on account of there being no poll book sent from that precinct. To fill the vacancy the board appointed James McMasters as supervisor from that township. Minert was chosen chairman for the year. In June S. W. Armstrong removed from the county, making thereby a vacancy in the board from Summerset and it was filled by the appointment of A. J. Ross. It was upon the first of January, 1866, that the board of supervisors for that year assembled at Fontanelle, when the following gentlemen took their seats: F. M. Corr, Washington; T. M. Ewing, Richland; J. W. Stinman, Jackson; A. P. Littleton, Greenfield; A. J. Ross, Summerset; M. P. Stockwell, Walnut; John Loucks, Jefferson; James McMasters, Grove; Fielden Key, Harrison; Jacob Bally, Grand River; and J. R. Short, Lincoln. Stinman was made the chairman. At the September meeting a vacancy was made on the board by the removal from the county of J. R. Short, of Lincoln Township, and Barnett Mills was appointed to fill the place. The board for the year 1867, was composed of: J. W. Stinman, F. M. Corr, James C. Gibbs, A. P. Littleton, T. M. Ewing, Barnett Mills, John Loucks, R. H. Marshall, James McMasters, Jacob Bally, Solomon Garrett. The board met on January 7, 1867, at Fontanelle and proceeded to organization by the election of A. P. Littleton as permanent chairman. In 1868, the board of supervisors met on January 6th, at Fontanelle, with the following membership: J. W. Stinman, James McMasters, R. H. Marshall, S. C. Vance, T. M. Ewing, B. F. McMullen, John J. Hetherington, Jacob Bally, Orin Dinsmore, Robert Snodgrass, Solomon Garrett. Stinman was chosen as chairman for the year. In June McMasters resigned his position on the board and Harrison Allspaugh was elected in his place. The board of supervisors for 1869 met at Fontanelle on January 4th, and the newly elected members duly sworn, took their seats. There were present the following: S. C. Vance, Robert Snodgrass, T. M. Ewing, Orin Dinsmore, R. W. Marshall, John Shreves, Joseph Smith, J. W. Stinman, L. C. Elliott, Jacob Bally, B. F. McMullen. L. C. Elliott had the honor of being elected chairman for the ensuing year on the organization of the county board. At the June meeting, in the absence of Dinsmore and Snodgrass, their places on the board were filled by the appointments of Ambrose Jenkins and William Stevens. At the same time, township 74, range 31, now known as Orient, was set off from the civil township of Greenfield and the board ordered that the county auditor place the necessary papers for the organization and election therein in the hands of Reinhart Schweers, and naming the Schweers schoolhouse as the place of holding the election. This new township was to be known by the name of Dayton. The first regular session of the board of supervisors for 1870 was held at Fontanelle on January 3d, with the following members present: L. C. Elliott, J. W. Stinman, John Schreeves, R. H. Marshall, W. M. Cady, S. C. Vance, Henry Fisk, A. Jenkins, L. R. McWhinny, J. A. Jennings, James McMasters, Joel E. Savage, R. C. Hitchcock. Vance was elected chairman. At the June session there was received by the board a petition from the legal voters that territory for the formation of a new township comprising all of congressional township 76 north, range 33 west, which was to be called Eureka. The board granted the petition, which had eleven signers, and ordered an election to be held at the house of G. E. Snyder at the time of the October election, 1870, and the warrant for the organization thereof was placed in the hands of H. Pangborn. The board also passed the following resolution: Resolved, that the county auditor is authorized to issue a county warrant for $100 in favor of the first person that will deliver to the county treasurer, for the use of the county, twenty bushels of good stone coal, dug from the coal bank in Adair County, Iowa, and that any person finding a vein of coal two feet thick, receive a county warrant for $200; three feet vein, $300: four feet vein, $400; five feet vein, $500; six feet vein, $600; and that sufficient to be produced to the satisfaction of the board of supervisors that said coal has been found as above named and of good quality. With the year 1871 a new order of things came into existence in regard to the composition of the board of supervisors. The cumbersome machinery of one representative from each township being entirely done away with and a board of three members elected at large by the county substituted in its place. The new board for that year met on January 2d and was composed of: A. P. Littleton, John J. Hetherington and A. Osborne. Littleton was made chairman for the ensuing year. At the April session of this board, township 77 north, range 33 west, was set off and made a separate civil township under the name of Summit, in response to a petition signed by twelve resident citizens. The schoolhouse on section 17 was designated as the place of holding the first election and Azariah Sisson the organizing officer. Those composing the board for 1872 were A. P. Littleton, A. Osborne and T. M. Ewing. They met on January 1st. Littleton was continued as chairman for the year. The board for the year 1873 was made of the same men, A. P. Littleton having been re-elected and was for a third time made chairman. For 1874 the board was composed of A. P. Littleton, T. M. Ewing and J. W. Hastings; Littleton still occupying the place of chairman. It was during the term of office of this board that the petition was brought up to remove the county seat to Greenfield and this board ordered the vote of the electors thereon. On January 4, 1875, the new board for the year met for the first time at Fontanelle and was composed of A. P. Littleton, J. W. Hastings and George A. Davis, Littleton still in the chair. The board of supervisors met for the first time in regular session in Greenfield on September 6, 1875, where they have continued to meet ever since. 1876 --- J. W. Hastings, George A. Davis, T. J. Graham, with Hastings as chairman. 1877 --- G. A. Davis, R. H. Marshall, J. T. Graham, with Davis as chairman. 1878 --- J. T. Graham, R. H. Marshall, Josiah Arnold, with Graham as chairman. 1879 --- R. H. Marshall, Josiah Arnold, James H. Hulbert. Marshall was chairman. 1880 --- Josiah Arnold, J. H. Hulbert, Thomas C. Neville. Arnold was chairman. 1881 --- J. H. Hulbert, T. C. Neville, B. F. Childs. Hulbert was chairman for the year. 1882 --- T. C. Neville, B. F. Childs, J. H. Hulbert. Neville was chairman. 1883 --- B. F. Childs, J. H. Hulbert, E. M. Ford. Childs was the chairman. 1884 --- J. H. Hulbert, E. M. Ford, George Faga. Hulbert served this year as chairman. On the 30th of May E. M. Ford resigned his position and on August 4th John McCrea was appointed to fill the vacancy. Since this time the following men have served the county as supervisors, each being elected for a term of three years in the year named: John McCrea, 1884; same, 1885; J. W. Rutt, 1886; W. B. Hoskins, 1887; Jeremiah M. Wilson, 1888; John Shaver, 1889; W. B. Hoskins, 1890; J. M. Wilson, 1891; David Eshelman, 1892; C. A. Ostrander, 1893; E. N. Fancher, 1894; C. A. Ostrander, 1896; J. C. Lane, 1897; Jeremiah W. Evans, 1898; John L. Garrett, 1899; W. W. Richey, 1900; J. W. Evans, 1901; John L. Garrett, W. R. Turner, 1902; W. R. Turner, 1903; George D. Musmaker, William A. Green, 1904; W. H. Brinton, J. S. Carlyle, W. N. Green, 1907; W. H. Brinton, H. H. Gerkin, 1908; W. N. Green, W. H. Brinton, 1910; H. H. Gerkin, T. A. Robinson, 1912; F. W. Fitzgerald, H. H. Gerkin, 1914. The above dates are those of the election. Theodore Smith, 1856-7; George B. Wilson, 1857-8; A. B. Smith, 1858; W. B. Hall, 1858-60; A. P. Littleton, 1860-2; W. B. Hall, 1862-4; W. B. Hall, 1864-6; W. B. Hall, 1866-8; James Raney, 1868-70; James Raney, 1870-2; John J. Hethgerington, 1872-4; John J. Hetherington, 1874-6; John J. Hetherington, 1876-8; J. N. Haddock, 1878-80; J. N. Haddock, 18800-2; J. N. Haddock, 1882-4; Daniel A. Hites, 1884-6; Daniel A. Hites, 1886-8; Daniel A. Hites, 1888-90; Seth W. Mount, 1890-2; Seth W. Mount, 1892-4; Seth W. Mount, 1894-6; H. G. Lynch, 1896-8; H. G. Lynch, 1898-1900; H. G. Lynch, 1900-02; J. C. Hoyt, 1902-4; J. C. Hoyt, 1904-6; E. W. Adams, 1906-8; E. W. Adams, 1908-10; Walter C. Smith, 1910-12; Walter C. Smith, 1912-14; C. F. Roark, 1914-16. N. S. Taylor, the last county judge, elected in 1868, became the first county auditor, ex-officio, when the former office was abolished. Following him came: J. H. Bailey, 1869-71; J. H. Bailey, 1871-3; W. B. Martin, 1873-5; W. B. Martin, 1875-7; D. W. Marquart, 1877-9; D. W. Marquart, 1879-81; D. W. Marquart, 1881-3; George H. Smith, 1883-5; George H. Smith, 1885-7; D. W. Young, 1887-9; D. W. Young, 1889-92; D. W. Young, 1892-4; L. B. Davis, 1894-6; L. B. Davis, 1896-8; J. D. Friel, 1898-1909; J. D. Friel, 1900-02; R. B. Oldham, 1902-4; R. B. Oldham, 1904-6; Charles E. Clark, 1906-8; Charles E. Clark, 1908-10; S. E. Alley, 1910-12; S. E. Alley, 1912-14; M. A. Gettis, 1914-16. The office of treasurer originated with the official position known as "treasurer and recorder." Joshua E. Chapman was elected to fill the dual position in 1854 and was succeeded by Francis M. Corr, 1857; S. W. Armstrong, 1858; Dr. T. M. Moore, 1861; G. F. Kilburn, 1863. During the latter's term of office the position of recorder was separated from that of treasurer and thus Kilburn became the first county treasurer. He served until 1866 and following him came: T. M. Moore, 1866-7; James C. Gibbs, 1867-9; James C. Gibbs, 1869-71; John Shreeves, 1871-3; L. J. Gray, 1873-5; L. J. Gray, 1875-7; John E. Hill, 1877-9; John E. Hill, 1879-81; John E. Hill, 1881-3; S. M. Shattuck, 1883-5; S. M. Shattuck, 1885-7; James A Hetherington, 1887-9; James A. Hetherington, 1889-91; A. D. Crooks, 1891-3; A. D. Crooks, 1893-5; J. S. Hulbert, 1895-7; J. S. Hulbert, 1897-9; S. H. Moffitt, 1899-01; S. H. Moffitt, 1901-03; G. W. Van Camp, 1903-6; G. W. Van Camp, 1906-8; S. M. Mercer, 1908-10; S. M. Mercer, 1910-12; R. M. Wilson, 1912-14; R. M. Wilson, 1914-16. The office of recorder becoming separate from that of treasurer in the latter part of 1864, at the election that fall W. H. Brainard was chosen to fill the position for one term. Following his came: Wesley Taylor, 1866-8; Wesley Taylor, 1868-70; Wesley Taylor, 1870-2; R. O. Brown, 1872-4; R. O. Brown, 1874-6; R. O. Brown 1876-8; John A. Easton, 1878-80; John A. Easton, 1880-2; E. S. Chenoweth, 1882-4; E. S. Chenoweth, 1884-6; William Bacon, 1886-8; William Bacon, 1888-90; R. O. Brown, 1890-2; R. O. Brown, 1892-4; T. W. Brown, 1894-6; T. W. Brown, 1896-8; John Chambers, 1898-1900; John Chambers, 1900-2; J. W. Roberts, 1902-4; J. W. Roberts, 1904-6; J. W. Roberts, 1906-8; M. G. McCreight, 1908-10; M. G. McCreight, 1910-12; Mrs. Tillie Hoadley, 1912-14; Minnie Barnett, 1914-16. Abner Root, 1854-7; Levi C. Elliott, 1857-9; John Ireland, 1859-61; J. K. Valentine, 1861-3; John Shreeves, 1863-5; P. G. Sage, 1865-7; Abner Root, 1867-9; George Salisbury, 1869-71; Solomon Garrett, 1871-3; C. B. Hunt, 1873-5; C. B. Hunt, 1875-77; C. B. Hunt, 1877-9; W. C. Libby, 1879-81; W. C. Libby, 1881-3; W. C. Libby, 1883-5; G. A. Callison, 1885-7; A. J. Kingery, 1887-9; A. J. Kingery, 1889-91; J. H. Curley, 1891-3; J. H. Curley, 1893-5; D. A. Patterson, 1895-7; D. A. Patterson, 1897-9; Charles L. Swinehart, 1899-01; Charles L. Swinehart, 1901-3; B. H. Kenworthy, 1903-6; B. H. Kenworthy, 1906-8; B. H. Kenworthy, 1908-10; H. J. Harbour, 1910-12; H. J. Harbour, 1912-15; J. W. Porter, 1914-16. Robert Wilson, 1857 (did not qualify): James P. Kenney, 1858; Philip Augustine, 1859-61; Philo G. Sage, 1861-3; Philip Augustine, 1863-5; J. McMaster, 1865-7; G. F. Kilburn, 1867-9; J. S. Waggener, 1869-70; N. S. Taylor, 1870-1; Joseph Gadd, 1871-3; N. S. Taylor, 1873-5; A. S. Carmichael, 1875-7; M. L. Bates, 1877-9; A. E. Markle, 1879-81; N. S. Taylor, 1881-3; E. B. Hicks, 1885-6; John C. Mason, 1886-7; E. B. Hicks, 1887-8; N. S. Taylor, 1888-9; W. H. Romesha, 1889-91; W. H. Romesha, 1891-3; W. H. Romesha, 1893-5; W. H. Romesha, 1895-7; W. H. Romesha, 1897-9; W. H. Romesha, 1899-1901; W. H. Romesha, 1901-3; E. Babcock, 1903-6; E. Babcock, 1906-8; E. Babcock, 1908-10; E. Babcock, 1910-12; E. Babcock, 1912-14; E. Babcock, 1914-16. S. W. Pryor, 1857-9; Simon Barrows, 1859-61; S. W. Pryor, 1863-5-7-9; J. M. Joseph, 1869-71; Waldo E. Adams, 1871-3; A. R. Dew, 1873-5; W. A. Prior, 1875-7; W. D. McCollum, 1877-9; W. R. Cochrane, 1879-81-3; F. M. Bates, 1883-5-7; George F. Clark, 1887-9-91; Frank Sargent, 1891-3; Eugene Wilson, 1893-5-7; George F. Clark, 1897-9-1901-3; A. C. Mayes, 1903-6-8-10-. The office of surveyor at this time was abolished and a county engineer appointed by the board of supervisors. C. H. Lehmkuhl has served continually as such. Joseph L. Sharp, 1852-4; Richard Tutt, 1854-6; M. L. McPherson, 1856-7; E. D. Smith, 1857-61; Collin Marshall, 1861-3; E. B. Fenn, 1863-5; A. L. McPherson, 1865-7; G. F. Kilburn, 1867-9; W. H. Merritt, 1869-71; Oliver Mills, 1871-3; W. H. Easton, 1873-5; M. K. Campbell, 1875-7; J. A. Hallock, 1877-9; Platt Wicks, 1879-81; Platt Wicks, 1881-3; John A. Storey, 1883-5-7; A. D. Crooks, 1887-9; P. McDermid, 1889-91; George F. Clark, 1891-3; W. B. Martin, 1893-5-7; K. R. Madden, 1897-9; Jerry M. Wilson, 1899-1901; W. H. McClure, 1901-3; R. W. Hollembeak, 1903-6; E. J. Sidey, 1906-8; J. T. Dalby, 1908-10; G. W. Van Camp, 1910-12; E. J. Sidey, 1912-14; Pierre McDermid, 1914-. George White, 1858-9-61; Simon Barrows, 1861-3; James Ewing, 1863-5; Wesley Taylor, 1865-7; C. J. Bowman, 1867-9; J. W. Peet, 1860-71; H. J. Morgan, 1871-3; Mary Childs, 1873-5; M. W. Haver, 1875-7-9; J. W. Boyer, 1879-81-3; M. W. Haver, 1883-5-7; C. L. Wilson, 1887-9; Bessie R. Wagstaff, 1889-91; C. L. Wilson, 1891-3; A. A. Taylor, 1893-5-7-9; A. B. Chantry, 1899-01; Ella C. Chantry, 1901-3-6; Omer Vandivier, 1906-8-10; Adaline Brooks, 1910-12. D. M. Valentine, 1856-62; John Leonard, 1862-4; H. W. Maxwell, 1864-6; S. D. Nichols, 1866-70; C. H. Gatch, 1870-4; H. Y. Smith, 1874-8; William Connor, Jr., 1878-82; A. W. Wilkinson, 1882-6; C. W> Neal, 1886-8-90; F. H. Gaines, 1890-2-4; F. E. Gates, 1894-6-8; C. T. Launder, 1898-1900-2; George D. Musmaker, 1902-6; Ed. R. Brown, 1906-8-10; M. C. Atchison, term ending December 31, 1910; O. W. Witham, term commencing January 1, 1911; O. W. Witham, 1912-14; D. A. Crowley, 1914-16. The first courthouse in the county was located, of course, at Fontanelle, the first county seat. It was constructed in 1856 by order of the county judge, J. J. Leeper. The county owned a quarter section of land which was divided into town lots and sold and the money derived therefrom devoted to the building of the house of justice. The house was twenty-six feet wide, thirty-six feet long and ten feet high. When the building was ready for a roof it was decided to add a second story. Native lumber was used in the construction of the building and the hardware fixtures were hauled from Keokuk by wagon. The courtroom was located on the lower floor and the second story was used for the office rooms. After the removal of the county seat to Greenfield the courtroom was used as schoolhouse, church, by fraternal societies and for entertainments. In fact, school and church had been held there all the time. This old courthouse was destroyed by fire on January 5, 1910. It was in use at the time as a town hall. "At 5 o'clock on Thursday morning Joseph Valentine, brother of James Valentine, proprietor of the Bon Ton Bakery, discovered that the rear portion of the building was on fire. It was already well under way and rapidly encroaching. The alarm was at once given and as soon as possible the bells were rung and the populace aroused. With no fire organization and no facilities for fighting the fire or pulling down buildings in its path, it seemed almost inevitable that all of the buildings on the southeast of the square would be burnt. Indeed nothing but the fact that there was little wind and a slight shower falling at the time, together with an almost superhuman exertions of the citizens, saved the entire east business part of the town. "The fire soon spread to Bruce's stable in the rear of the Bon Ton and also swept its way along the row of buildings consisting of Randolph's meat market, Porter Brothers' barber shop, and Martin & Gray's land office, to the courthouse which was soon wrapped in flames. At the same time the fire leaped across the sixteen-foot alley to the stable of the Methodist Episcopal parsonage. From this there was almost a solid block of about twenty buildings westward along the south side of the square to Adair Street, with here and there a space of only three feet between them. It spread rapidly along this row, taking John A. Storey's stable, John Shreeves' furniture store, and C. N. Wilson's flour and feed store. Between this and the postoffice building there was a passage of three feet. If it could be stopped there the rest might be saved; if not, the whole group must go. More heroic valor was never shown upon the battlefield than was shown here. A line was formed and water in great quantities was carried and thrown over the postoffice building constantly. And men actually stood and worked in that narrow pass of three feet, throwing water over themselves and the building until the Wilson building burned down and the wall caved in, thereby saving the postoffice and preventing farther progress of the flames. Some gave out exhausted and others held their places until the victory was won. "The courthouse had just been insured for $2,400 and the county records were saved in the vaults." Holy Bible, donated by Teague and Sampson. Constitution and by-laws of Crusade Lodge, 386, A. F. and A. M., with list of officers and members. A. M., with list of officers and members. Officers and members of St. John's Chapter, 73, R. A. M., Fontanelle, Ia. List of officers and members Greenfield Chapter, O. E. S.
Abstract of history of Adair County, by J. M. Gow. One bottle each of corn, wine and oil. Brief history of the city of Greenfield, from December 10, 1856, to date, by A. L. Hager. History of Greenfield Transcript, by J. M. Gow. History of M. E. Church, Greenfield, by Rev. A. W. Armstrong, pastor. List of county officers of Adair County. History of the organization of the Citizens Bank of Greenfield, with note, check, draft, notice and three pieces of coin, by J. J. Hetherington. Letter by D. Heaton, to be opened by the oldest man present when taken out. Duplicate tax receipt, by James A. Hetherington, treasurer. A letter to be opened by Crusade Lodge, 386, A. F. and A. M., on opening the casket, by E. H. Bickford. A letter by the members of Crusade Lodge, 386, A. F. and A. M., to the brethren who may open the casket. A short business biography; also a record of the destructive fires of 1889, to be opened by the oldest merchant present in business in the City of Greenfield when opened, by E. E. Warren. A piece of millstone, with history, by W. E. Chamberlain. Professional card of T. W. Mulhern, M. D.
History of Greenfield schools from organization of town to date, by M. W. Rodgers and S. C. Vance, to be opened by president of school board. Copy of the Greenfield Transcript. Copy of Adair County Democrat. Copy of Des Moines Leader. Copy of Des Moines State Register. A nickel, issue of 1891, by J. M. Timberlake. History of Crusade Lodge, 386, A. F. and A. M., by J. E. Howe. 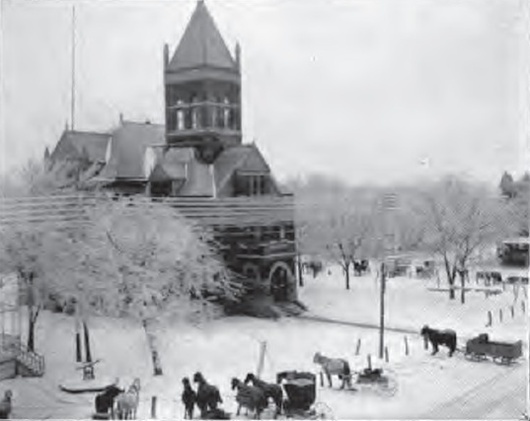 The building was completed and accepted by the board of supervisors on March 25, 1892. It is located in the center of the public square, with a frontage of fifty-seven and a half feet and a depth of ninety-two feet, built of pressed brick and hewn stone. The total cost, including furniture was only $23,768. The new jail building was formally accepted by the Board of Supervisors of Adair County on December 8, 1903. The contract for the jail was let in April, 1903, to the Pauly Jail Building Company of St. Louis; the contract price being $11,990. The Pauly people sublet the contract, excepting the cell work and plumbing, to M. D. Clark & Sons, local contractors, who did the masonry and carpentry work on the structure. The plumbing was done by the Creston Heating & Plumbing Company, which also put in the steam furnace. The Pauly people sent one of their men here for about two months to put in the steel work of the cells and to oversee the finishing of the work. The new jail contains seven living rooms for the jailer, three rooms on the first floor and four rooms upstairs, ample closet room, as well appointed a kitchen, fitted up with range and hot and cold water, as any housewife could wish, lavatory and bathroom, and is in fact a model residence. The residence portion is in the front part of the building. In the rear, separated from the residence by a fire proof cement wall and massive iron door, is the jail. Here as in the residence part everything is up-to-date, and the best system known to the prison builder's trade is used here. On the first floor of the jail are four cells. Two of these, separated from the main cells, are for women prisoners. They are fitted with folding wall bunks, have hot and cold water in each cell and are so arranged that the occupants can shut themselves from the sight of the public. On the first floor are also two cells to be used for the detention of desperate criminals. These cells are of hardened steel and completely surrounded by a jailer's corridor. Opening from these two cells is an exercise corridor for the prisoners, containing a lavatory and water closet. The doors to these cells can be operated at will from the jailer's corridor by means of levers which operate the doors either singly or together as the jailer desires. The lock on these cells is a combination and key affair. The key cannot be used without first working the combination, thus making the locks doubly secure. There are four hammock banks in each of these cells. There are two cells on the second floor and these are also surrounded by a jailer's corridor. The locking device for these cells, while not the same as on the cells downstairs, is worked by combination and key. There is an aperature in each cell through which to pass the prisoners their food. By this means a woman can feed the prisoners without placing herself in the least danger. The plumbing and heating seems to be perfect. Steam heat is used and hot and cold water is furnished all over the building. There is also a bathroom in the jail. The masonry and brick work is said to be as fine work as can be done. The walls in the residence portion are white finished and the rooms are finished in hard pine, natural finish. In the basement is a pressure tank which furnishes water for the building. The furnace is of the latest, improved pattern and is more than ample for heating the building. Prior to the building of the new jail, prisoners were taken to surrounding counties for safe keeping. Prior to the acquiring of a county poor farm the care of the poor, the destitute, the helpless and insane was a serious problem. Certain families residing here were generally paid by the county for caring for one or more unfortunates, a method which was not only expensive, but often resulted in lack of care to the individual compelled to seek assistance. At length, on February 4, 1885, a tract of ground on the southwest quarter of section 32, Grove Township, was purchased of D. Heaton and wife for the sum of $2,000. Buildings were added to this farm and it was created a county poor farm. Samuel Ewing was the first steward, receiving $500 per annum for his work, which was just half of what is now paid. Usual farm occupations are offered to the inmates of this institution.